Last week the Wakefield Memorial High School Class of 1983 Reunion Committee raffled a framed 41” x 29” print of my drawing titled Partitionism and Social Law. The fundraiser was a benefit to our town’s First Baptist Church after it was destroyed by lightning the previous month. The Massachusetts church had stood tall and beautiful for 150 years. 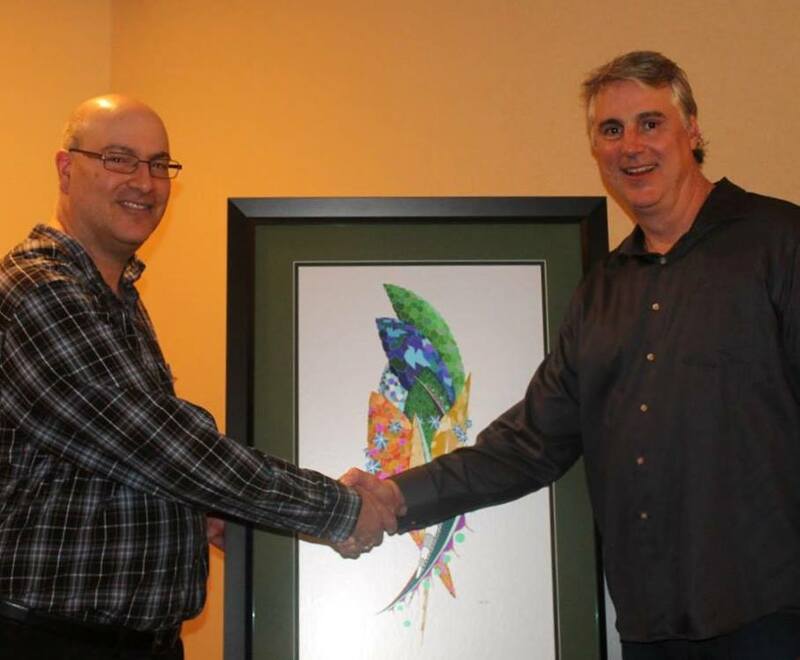 The raffled artwork was printed on metallic paper, which the print house mounted on rigid strata. The artwork will be wrinkle-free for its lifetime. Ara Hagopian and raffle prize winner shake hands. Four Points Sheraton Hotel, Wakefield MA, 11/24/2018. The drawing is detailed and symbolic, and I spent much of the raffle night discussing the artwork’s meaning with my classmates. Partitionism and Social Law depicts a gathering of nine characters. Actually, there are eight individuals in this community, plus elements of law enforcement, and a visitor. The make-up of each individual, as well as how the community treats visitors, is the heart of the artwork’s theme. Partitionism and Social Law (2011). Let’s take a look at the top half of the picture. Here you can see some of the colors and patterns of the characters—the characters being the eight elongated, multi-colored forms. I wanted to make each of these “members of the community” their own shape, and as you can see, there are wonderful differences between them. Some characters are thin, some have smooth edges, and some stay partially-hidden, while the others, like the bright green fellow at the top, reach out. Each character has a color pattern that is unique, which partly has to do with their age and background, but also reflects their degree of willingness to expose themselves to risk. Aside from patterns, each character has a color palette, again underscoring individual uniqueness. Together these eight make a close and friendly community. Defining each character by shape, pattern, attitude and palette helps clarify the story, in a complex rendering. 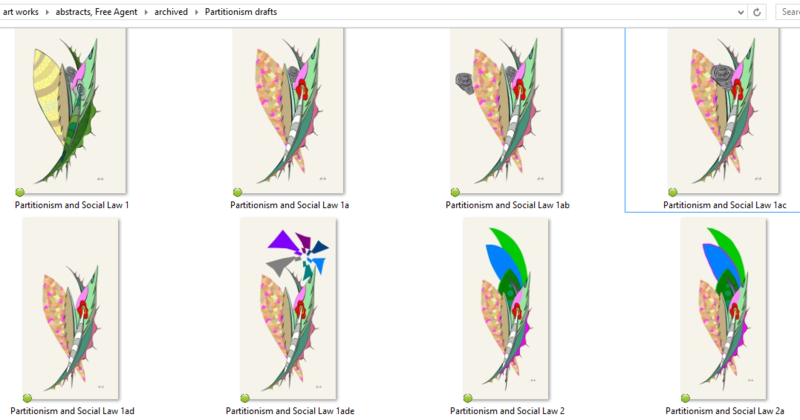 Between December 19, 2010 and January 4, 2011, I’d completed 73 drafts of Partitionism and Social Law. 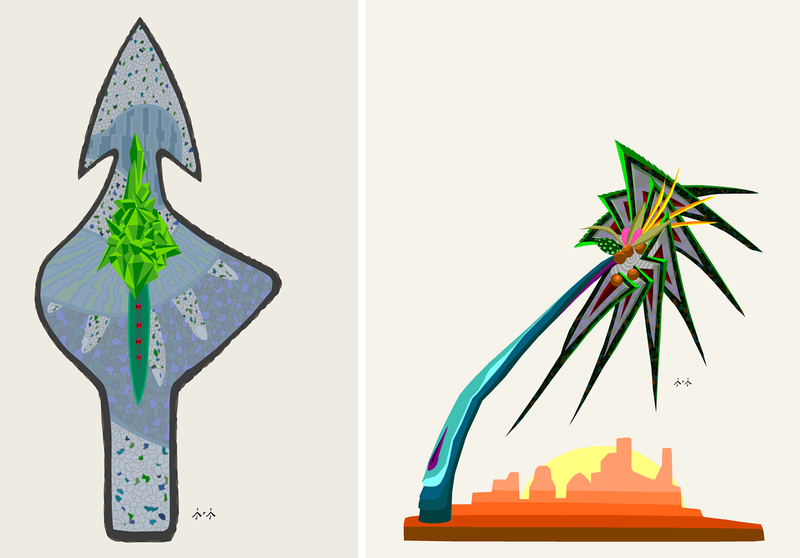 She started out as pen and ink on paper, and was finished in MS Paint, like all my abstracts in this century. Below are some of the early drafts. I had the title and theme from day 1. Every day I’d give my friend Jen an update on progress, and the thoughts behind the decisions. Early drafts. These are the first 8 drafts out of 73 in total. The early drafts were made when I was working on the picture and trying out different ideas. I’d stand back and see if there was something there, some hint at what could be interesting, or be made into something grand. This is where judgment helps, and it’s crucial for the artist to be trained to say big yeses or big nos. Yes if the drawing checks the boxes: Interesting? Original? Beautiful? Entertaining? And an artist has to know “no”. No, this isn’t working. No, it’s a re-hash of a previous work. No, it doesn’t move my portfolio forward. No, the picture (or a given element) is not so great. Other questions I ask when making a drawing: Is it too busy? Too simple for its story? While drawing, I evaluate each section with a critical eye. If a part of the drawing is strong, I’ll leave it alone, and let it sit for awhile. 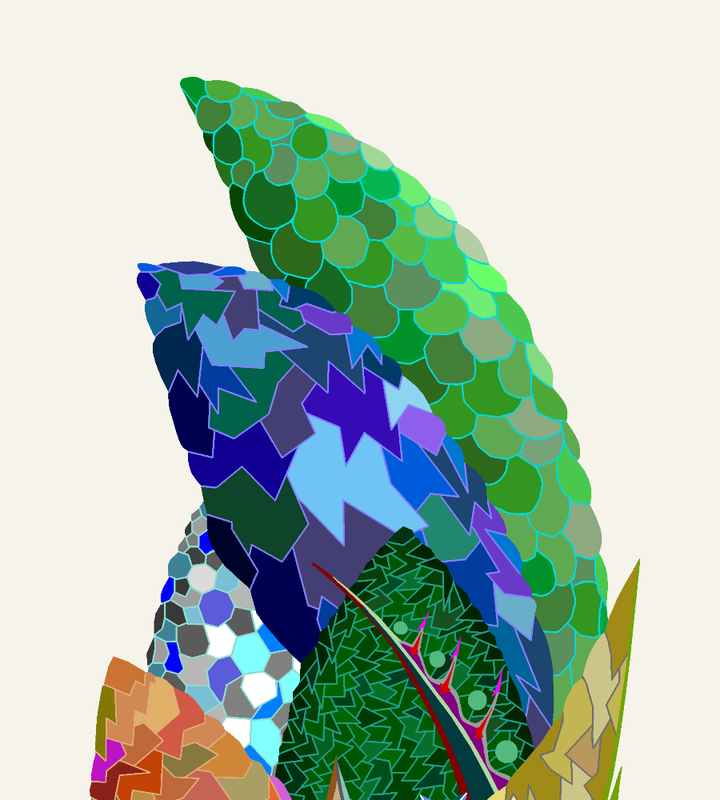 If I’m not liking what I’m seeing, I’ll refine the lines, adjusting the thickness to suit the area. For me, making art is always a critical discussion. It needs to be a hard talk with myself; I’ll challenge every line, form and color. When I challenge the in-process drawing, I say things like: You’re weak here– disguise this angle. Can I add dimension other than the typical way? How far can we (that is, me and the picture) exaggerate what’s working well? How can we make the best parts more obvious? Does each line serve the theme of this picture? If yes/ keep it. If no/ minimize it or remove it, or convert it into something that serves. Why is this line here? Why this thickness, form, and color? How does it serve the structure and story? What’s the role of a given portion of the drawing? The early drafts of this picture went through the big nos and yeses and stands all the better for it, as a completed work. There has to be a viewer’s appeal in the drawing’s overall shape, and also, in the details of the components. The picture’s big themes and elements need to have a wow factor, and the close-up inspection needs to be worthy of the structure. This is how I want to engage the viewer. It’s a shame there’s no record of the daily and sometimes hourly discussions and emails I had with my friend Jen, during the three weeks this drawing was being created. I didn’t show her the work but told her of my excitement with the project, and my color choices. The colors were changing until the last day. There is weight to color value, and there is weight to overall design too. The two elements need to be in focus with each other. These are not easy choices. A light-colored Partitionism and Social Law didn’t quite work with the density of content. As much as I hated giving up on many beautiful pastel colors, she needed darker grounding. These were the discussions I had with Jen, who knew my artwork better than anyone on the planet. Partitionism is a term I coined in 2010, to describe the drawing style I was developing that summer, fall and winter. I was completing a new drawing every 2-3 weeks and was excited as this new style began to work into my art pieces. Palnita, Art of The Ancient Americas had a great Partitionism pattern. There is some Partitionism in the palm fronds in Tree of Doubt Threatens Sandcastle City as well. Later on, Jazz Music (2011) and The Carney (2013) followed suit. Early Partitionism drawing style. LEFT: Palnita, Art of the Ancient Americas (summer 2010) and RIGHT: Tree of Doubt Threatens Sandcastle City (December 2010). Partitionism applies to an overlapping and interlocking drawing pattern. Partitionism is not a depiction of stained-glass, although at first-look that’s exactly what it appears to be. Unlike Tiffany-style panels, Partitionism is a structural—not decorative—element that adds strength and texture to the surfaces on which it appears. The partition sizes equal the amount of risk a character’s willing to accept. Smaller partitions indicate a more conservative approach, with less vulnerability. Larger partitions require less concentration; in essence, the individual is managing fewer parts. Other than that, there are no costs or trade offs associated with partition sizes. For the individuals in the group, composition is a personal choice, and is ever-changing. Now I’ll define Social Law, in the strict context of this work’s story. Social Law is a polite courtesy that well-mannered people cannot help but offer to strangers and friends alike. Social Law exists because those who are thriving tend to extend niceties to all manners of people they encounter. Again, this definition applies to the community I’ve created in the artwork. When we live within Social Law, we allow people to get close to us—this is a demonstration of goodwill. It is also good for community relations, personal growth and business. The artwork asks a question: What personal and professional risks are present with Social Law? How can these risks be mitigated if Partitionism is embraced, and what are the consequences if it’s ignored? To read about the final reveal, and what’s ultimately happening in this picture, refer to pages 50-54 in my first book, WHAT HAPPENED TO VICKY LEE? A COLLECTION OF STORIES (The Literate Show Press, 2013). This entry was posted in Artwork, Wakefield. Bookmark the permalink.